The 96th Bomb Squadron is a unit of the United States Air Force 2d Operations Group located at Barksdale Air Force Base, Louisiana. The 96th is equipped with the Boeing B-52H Stratofortress. Formed in August 1917, the 96 BS saw combat on the World War I Western Front, in France. It took part in the St. Mihiel offensive and Meuse-Argonne offensive. Later, it served with the Army Air Service and Army Air Corps in the Inter-War period it participated in Brig. Gen. Billy Mitchell's 1921 off-shore bombing tests and during World War II fought in the North African and Italian Campaigns. It was a part of Strategic Air Command during the Cold War. Since 1993, the 96th Bomb Squadron has flown the B-52H Stratofortress long-range heavy bomber, which can perform a variety of missions. Today the squadron is engaged in the Global War on Terrorism. The 96th Aero Squadron was America's first bomb squadron. It was formed at Kelly Field, Texas. Originally consisting of 80 men, largely college graduates or college dropouts, volunteers all, and something of an elite group, since their aeronautical qualifications were the highest in the U.S. Army Air Service. Just before embarking upon its first aerial warfare, the squadron decided upon its insignia, a black triangle outlined by a white strip enclosing the profile of a red devil thumbing his nose at the ground with his left hand. In his right, he held a white bomb. This distinctive emblem was designed by the squadron's talented graphic artist, Harry O. Lawson. SMS Ostfriesland with a bomb exploding near her bow 1921. On 13 July the Army airmen made their first appearance. The Martin bombers (limited to 300-pound bombs by the rules of the service test by the Navy) sank the former German destroyer G-102 in 19 minutes. 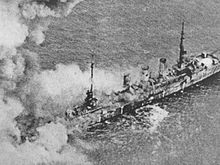 On 18 July Navy and Army airplanes took turns attacking the former German light cruiser SMS Frankfurt. No bomb heavier than 600 pounds was allowed. There were frequent intermissions as inspectors dragged out their on-board inspections. The Air Service was finally allowed to strike and sank the vessel with 600-pound bombs. The Navy, which had figured on using gunfire from ships to finish off Frankfurt, was surprised. On 21 July a flight of six Martins and two Handley Pages, each carrying a 2,000-pound bomb. As the pilots stood by waiting to take off, Johnson called with a change in rules. The bombers could bring no more than three of their biggest bombs to the target area. The written agreement had been that the Air Service would be allowed two direct hits with their biggest bombs. One of the Handley Pages had to drop out of the formation, but the other seven airplanes went on to the target. They had no intention of making two direct hits and stopping the test. Their orders were to aim for near misses to create water hammer shock waves against the hull. The first bomb fell at 12:18 p.m. It was a near miss, as planned. The other airplanes swept in at spaced intervals and delivered their ordnance. "We could see her rise eight or 10 feet between the terrific blows from under water," Mitchell said. The sixth bomb, at 12:31, sealed Ostfriesland’s doom. Twenty-two minutes after the first bomb fell, the old battleship sank at 12:40. The seventh airplane, a Handley Page, dropped its unneeded bomb as a final salute at the point where the battleship had gone down. Received new Boeing B-17B Flying Fortress in the summer of 1939, being one of the first three squadrons to receive the new bomber. In November 1939, seven Fortresses flew from Langley Field to Rio de Janeiro, Brazil on a good-will mission. All planes returned safely with no major incidents, once again demonstrating the safety and reliability of the B-17 design. Lockheed-Vega B-17G-50-VE Fortress-44-8167-96th Bomb Squadron. After the Attack on Pearl Harbor, served on antisubmarine duty along the mid-Atlantic coastline as part of I Bomber Command for several months until AAF Antisubmarine Command was formed and took over that duty. Re-equipped with more modern B-17F Flying Fortresses and assigned to II Bomber Command in Pacific Northwest for transition and combat training in late 1942 and early 1943. Moved to North Africa in April 1943, carrying out bombing missions in Algeria and Tunisia as part of Twelfth Air Force during the North African Campaign. Flew many support and interdictory missions, bombing such targets as marshalling yards, airdromes, troop concentrations, bridges, docks, and shipping. Participated in the defeat of Axis forces in Tunisia, Apr-May 1943; the reduction of Pantelleria and the preparations for the invasion of Sicily, May-Jul 1943; the invasion of Italy, Sep 1943. En route to bomb a vital aircraft factory at Steyr on 24 Feb 1944, the group was greatly outnumbered by enemy interceptors, but it maintained its formation and bombed the target, receiving a Distinguished Service Cross for the performance. On the following day, while on a mission to attack aircraft factories at Regensburg, it met similar opposition equally well and was awarded a second DUC. Served as part of the occupation force in Italy after V-E Day. Inactivated in Italy on 28 Feb 1946. Reactivated under Strategic Air Command on 1 July 1947 and equipped with Boeing B-29 Superfortresses. Trained for strategic bombardment missions during the postwar years, being upgraded to the new atomic bomb-capable Boeing B-50 Superfortress in 1948. Replaced the propeller-driven B-50s with new Boeing B-47E Stratojet swept-wing medium bombers in 1954, capable of flying at high subsonic speeds and primarily designed for penetrating the airspace of the Soviet Union. In the late 1950s, the B-47 was considered to be reaching obsolescence, and was being phased out of SAC's strategic arsenal. Began sending aircraft to other B-47 wings as replacements or to storage at Davis-Monthan Air Force Base, Arizona in late 1962 and was inactivated in April 1963. The Linebacker Trophy for best B-52 Squadron in 2011. ^ Aircraft is Boeing B-52H-145-BW Stratofortress serial 60-28. ^ "On a disc vert, a caricatured devil proper facing dexter, grasping in his dexter hand a bomb argent inside a triangle of the second and filled sable, all within a narrow border yellow. Attached below the disc, a blue scroll edged with a narrow yellow border and inscribed "96TH BOMB SQ” in Yellow letters. The emblem is symbolic of the “Daredevil” qualities of fearlessness and boldness, the devil characterizes the spirit of the Squadron and its past and present personnel. The bomb represents the historic mission of the unit, which it has performed since the beginning of aerial warfare in World War I." "Uniformed Services, U,S, Air Force Heraldry, 96th Bomb Squadron". The Institute of Heraldry. Retrieved 1 September 2017. ^ a b c d e f g h Robertson, Patsy (20 February 2015). "Factsheet 96 Bomb Squadron (ACC)". Air Force Historical Research Agency. Archived from the original on 27 September 2015. Retrieved 1 September 2017. ^ a b c d e f g h i j k l "Barksdale Air Force Base Library: Factsheet 2nd Bomb Wing". 2d Bomb Wing Public Affairs. Archived from the original on 26 September 2009. Retrieved 2 September 2017. ^ a b c Correll, John T. (2008). "Billy Mitchell and the Battleships". Air Force Magazine. Air Force Association. Vol. 91 (Number 6). Retrieved 2 September 2017. ^ Baugher, Joe (16 July 1999). "Boeing B-17B Fortress". joebaugher.com. Retrieved 2 September 2017. Gorrell, Col. Edgar S. (1974). History of the American Expeditionary Forces Air Service, 1917-1919. Series E: Squadron Histories. Vol. 14 History of the 96th Aero Squadron. Washington, DC: National Archives and Records Service, General Services Administration. OCLC 215070705.